Today I want to take a quick look at what I think are some of the best tasting, reduced calorie products available at your grocery store. Have you tried any of these yet? They are a great addition to any diet/smart eating plan! These high fiber tortillas can be used as roti, too! Start reading labels at your grocery store. 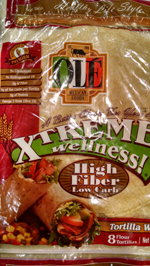 More brands are coming up with high fiber wraps and tortillas like the one made by Ole (Xtreme Wellness). The one in the photo here has only 90 calories, 9 grams of fiber per serving, and is large enough to hold enough chicken, cheese, and veggies to satisfy even large appetites like mine. Check the bread section at your store and see if you can beat or match the calorie and fiber profile. FlatOut is another brand that makes large wraps, and comes in a variety of flavors. I’ve seen them at several grocery stores with each serving about 90-100 calories. PB2, Powdered Peanut Butter (45 cals for 2 TBSPs compared to 200 calories for 2 TBSPs of peanut butter). Made by Bell Plantations, this powdered peanut butter can be used in a lot of recipes and mixed with water to make a low-cal version of peanut butter, added to protein shakes, pudding, etc. My favorite way to use this product is to mix this with chocolate whey protein powder, and blend with ice and water. I also mix it in with chocolate pudding. The company website has a complete recipe book too! For those of you that enjoy adding something to your whey protein shake, this unsweetened cashew “milk” adds a mere 25 calories per 1 cup serving. That’s a little bit less than light almond milk (which ranges from 35-60 calories/cup) and quite a bit less than skim milk (80 calories/cup). I’ve always been happy with plain water added to my whey protein, but the cashew milk adds creaminess if you like that. You can find the nutrition information here. Makes no calorie, no sugar, no carb, gluten-free sauces, salad dressings, syrups, dips, jellies, and much much more. The raspberry salad vinaigrette dressing is my absolute favorite from their line. Check out the web site! If you haven’t tried this, it’s pretty neat. They sell them at our local grocery store (HEB in Austin) and they come in both salty/savory and sweet flavors. It’s like an oversized rice cake, but with only 15 calories. So for those of you that crave crunchy + sweet and/or crunchy/salty (if I had a dollar for every person in Austin that can’t live without chips and salsa…), this treat is worth a try. 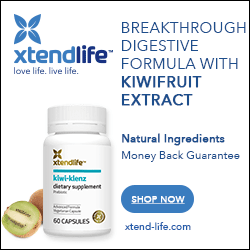 People pay big bucks for colon cleansing and detox products, and it’s no wonder. The typical American diet is largely devoid of fiber, and you might not be getting enough if you eat out frequently, dislike vegetables, or consume too many processed foods on a regular basis. Ideally, you have found a way to include several servings of fresh veggies and fruits in your daily diet. But if you need more or other sources of dietary fiber, the Fiber One brand has come up with a complete line of breakfast, snack, and desert products to help you meet your daily needs (at least 30 grams). Whey protein is an excellent source of high quality and convenient take-it-with-you protein. You should try to include a serving of lean protein at every meal, and this can be challenging if you’re vegetarian, can’t stand too much chicken, beef, and eggs on a daily basis, are always on the go, and so on. There are numerous options for whey protein. Visit the vitamin aisle at your grocery store or your local health food store. Try one of the single serving packets if you’re weary of buying a big tub. For retailed versions, I like the either Muscle Milk Light (100 cals/scoop), GNC’s Whey Protein Complete (100 cals/scoop), or Optimum Nutrition’s 100% Gold Standard Whey (120 cals/scoop). Unless you’ve been living under a rock, you might have noticed that several brands are coming out with sliced bread that come in at only 40 calories/slice. Brand such as Nature’s Own now carry a full line of breads (white, wheat, honey wheat, double-fiber, etc.) in their reduced-calorie/Light line that contain half the calories of conventional sliced bread. Again, start reading labels at the grocery store. Most people swear off of all bread and carbs when they are trying to shed some pounds, and that’s not required. For many of us, it’s about making simple changes and tradeoffs to choices we already make that can steer us towards our weight loss goals. Greek Yogurt: Many brands are now coming out with versions of seasonal flavors of Greek Yogurt (such as Caramel Apple Pie, Chocolate Cherry, Salted Caramel, Toasted Vanilla Coconut, etc). Used to be that you could only get peach, blueberry, strawberry, but I’m seeing a LOT more variety at the grocery store for this convenient high protein snack. Check out the nutrition information and the variety of flavors here. This particular brand checks in at a mere 80 calories. If you wanted, you could probably freeze it and top it off with some fresh fruit for a nice desert, too. Muffins: Vitalicious has a delicious “Vitamuffin” and I love the Deep Chocolate flavor. Although the size is smaller than a coffee house portion, it’s probably appropriate for most appetites. 100 calories, 9 grams of fiber, and “enriched” with plenty of vitamins (as the name implies). You can find this in the frozen novelties section of your grocery store, or in the frozen prepared breakfast section. Granted, this category isn’t necessarily “diet-friendly” in the calorie content sense (gluten free products are often higher in calories than a regular wheat product), but if you’ve got a gluten allergy or are trying to avoid it, you probably have no choice. The market of gluten-free products is growing much like the fat-free and low-carb market was, and it’s hard to know which products are actually tasty. Since you will be paying more for gluten-free, it helps to know what tastes good. I hope that my list of some of my favorite best diet products helps you out. See you at the grocery store! Sumi Singh is a personal trainer and group fitness instructor in Austin, TX, an online diet coach, and the author of the weight loss book, Stay at Home Strong.